It isn’t October because God wants me to have a purpose in life that revolves on him and not on the next episode of AMC’s The Walking Dead. Season four arrives in October and I am one of the many mindless fans pressed up against the chain link fences aching for just one more taste of the writers’ brains. That’s right, folks, it’s time for a return to America’s favorite zombie apocalypse. The common use of the term has nothing to do with the original word (Revelation as in the Revelation to John) and more to do with the end of the world sense that is included in the Revelation to John. Don’t tell the atheists that once again they’re incorporating Christian ideas into their everyday speech. Or do. It is occasionally fun to watch someone’s blood pressure rise in front of you. Walking Dead (the television series, and not the books) have achieved worldwide fame and greatness in part because of the double-meaning of the word apocalypse. On one hand, it is a story about a group of men, women, and children who survive the near-end of their world. But what makes apocalyptic fiction so compelling is that when all exterior, artificial norms are stripped away the true nature of a person shines through in the choices they make. Take the Hollywood leftist stereotypical redneck brothers Darryl and Merle. Before the zombies, the outside world would probably never have seen a difference between them. One shorter, younger, the other older, and bigger, but both rough, both relatively uneducated, probably with a criminal record, racist… The word “no account” seems almost stapled to their foreheads in the opening episodes of Season 1. But at heart the brothers, who care deeply about one another, are fundamentally different people. Both are predators in the strictest sense. They can and do kill, but in a world where making walking monsters lie down and be still is required to see tomorrow, the capacity for violence stops being a terrifying thing. In fact it is fair to say that the survivors of a zombie apocalypse are almost exclusively drawn from that subset of humanity with the will and ability to do violence, since the rest have become the greatest threat. The question of any good action adventure worth its salt is not how one can do violence but why and when they would choose to do so. Merle’s so full of hate for the whole world that he will hurt anyone, do anything to satisfy himself at the moment. In other Words, his god is his stomach. Darryl has no lack of anger, and it’s clear that he’s had a really rough childhood, but time and time again he choses to put himself on the line for the other instead of against them. Dingos and dogs are both predators, mind you, but we want one by our side in the wilderness and never want to be around the other. This is what separates the concept of the warrior from the thug. The dichotomy of strength that preserves and strength that preys isn’t limited to Merle and Darryl. The two police officers embody this dichotomy as well. Rick leads the group and Shane protects ‘his’ adopted family. For a long time, those two things seem to work in harmony, but one is altruistic and the other is ultimately selfish. Rick will sacrifice himself like a good shepherd, and Shane will kill to keep what’s his. In season three Rick’s leadership of his group contrasts vividly with The Governor’s rule in Woodbury. Clever contrasts go a long way towards making a good story, but The Walking Dead surpasses that. Characterization itself is part of the greatness. Set in Georgia, the series takes advantage of some sympathies and stereotypes that are more commonly thought of as southern than Hollywood. Hershel and his family are Christians, and genuinely so. They don’t form crackpot theories out of thin air (though they are initially deceived as to the status of the walkers). They’re not preachy. But as time goes on, and they endure, endure, and endure in circumstances where others cannot or will not, the strength of their faith makes them the emotional and moral core of the group. This is a stark contrast to the typical depiction of Christian males as either fakes, fools, or child molesters in waiting. Another mark of greatness that shows its face is character growth. Even facing death we watch our heroes grow in strength as they overcome, endure, or escape challenge after challenge. The outcasts and isolated members become adopted into the character group, an action that resonates with the fundamental God-given desire in mankind to love, be loved, and belong. Most recently the samurai outcast Michonne has taken this journey on-screen. As a child I heard a motivational speaker mention that “everyone likes an underdog, but everyone loves the top dog.” We see this journey from wimp to warrior again and again in the series, which is its own reward. Melissa McBride’s notable character Carol goes from battered wife to crack shot by the end of season two, and I am hard pressed to remember her missing a head shot once she finds her strength. We all feel fear, and we would all like to believe that we have it within us to be great. Rick’s son Karl also grows from child to young warrior on screen, and faces unique challenges as he is the only member of the team who has really known no other version of adulthood than this bloody and challenging world. The final mark of greatness in this series is the ultimate requirement for a good apocalyptic story: rebuilding. If you want to burn the world down, that’s fine, but even the Bolsheviks and other anarchists in the world only wanted to destroy established order in the hope of something better growing from the ashes. It’s not really so far fetched. This world will in fact waste away (Isaiah 51:6) and a great new one will replace it. This innate hope of heaven shines through in the truly exceptional apocalyptic dramas where we follow our outnumbered heroes as they begin to build something stronger than what was lost. Abusive situations are stripped away. Darryl’s prejudice is overcome by the strength of companionship and friendship. The women become stronger, more assertively independent, which only makes them more beautiful. The boys and men become bolder and stronger protectors, defenders, and heroes. The lonely learn how to love and let others in. The strong learn how to lend their strength to others. These themes aren’t just pleasing, they’re a glorious reflection of the Gospel, whether or not anyone cites chapter and verse. We serve a God who invites, welcomes, and loves us. He is a mighty warrior who trains our hands to war, and shelters us beneath his wings. In a dark world, the brightness of advancing plot lines can shine through in apocalyptic fiction as few other genres. When nothing is left, everything a hero can accomplish changes their whole world, however broad that scope may be. 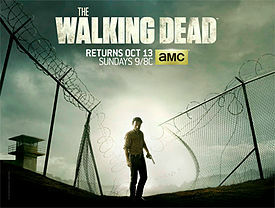 The Walking Dead has an advantage over other television series that aren’t based on successful graphic novels’ series. It is a retelling and upgrade of the original story rather than a slavish use of the original series as a storyboard. Characters live, grow, and change in new ways in this story. (I’ve been warned by people I trust that I would not enjoy the graphic novels anywhere near as much as the television series, and I’m inclined to believe them.) In real life, while many authors I know have wished they had the time to go back and re-tell stories to get them right, fix them up, and make them better, raw economics means that almost never happens… Unless your story becomes a hit television series! The Walking Dead is not the only series to gain a fresh breath of life from this approach. The pornographic Game of Thrones is so much more successful than the novels it is based on, because the story demands more hope and heroism than the novels do, that when last I heard George Martin has abandoned the novel series to work exclusively on the television series. The Walking Dead is still a zombie show. There is gore here, just as there is in almost every modern war, martial arts, or horror film, and it is squishy in all of its glory. The special effects crew here does the best job of zombie violence that I have ever seen in my life. But technical accuracy is nothing if the effects overwhelm or offset the story. Instead the genre-specific effects adorn the story like gold filigree in a functional sword. It augments the functional beauty of the story, but there is nothing in the story or the acting that wouldn’t work if AMC was suddenly stuck with the Styrofoam special effects budget of BBC’s Dr. Who from the 1970’s. The director dares to understate the horror if it is appropriate rather than bludgeon the audience about the head with his effects budget. Once again my review of the series departs radically from the mainstream American Christian critics. Is there gore here? Yes. And it’s better-filmed than the gore in Judges, Genesis, and Revelation. Is there predation? Yes, and there are those who would stand up to it, just as in the historical books. Just as in the Judeo-Christian Old Testament the violence is much less than historically took place in lawless societies. I could not condemn a story with such strong positive themes for these aspects and then go read the first ten or twelve books of the Bible. Previews of season four indicate that upcoming themes will be teaching compassion to Karl the child-warrior, overcoming the grief of loss, struggling to build a new community, and the continuing themes of combined strength, enduring hope, and persevering work. Why isn’t it October yet? !